As one of many respected Shawnee dentists, Dr. Dervin and our caring team are here to ensure your visit is as comfortable and pleasant as possible. The moment you enter our office, you’ll be greeted with a friendly smile by our front office staff. You’ll enjoy a calming environment with a clean office and beautiful scenery. We’ll never proceed with treatment without your permission. 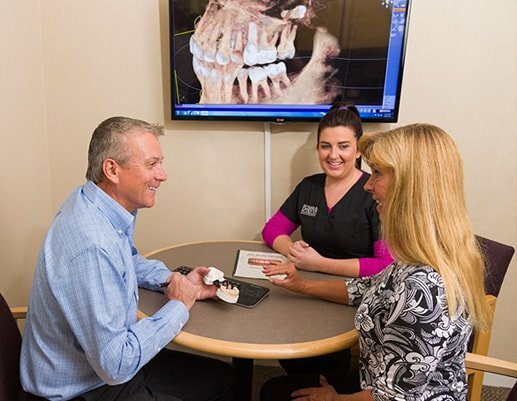 We’ll perform a thorough exam of your mouth and discuss your goals and concerns. We’re here to help YOU. At your appointment, we’ll take the time to ensure all of your questions are answered and make sure you’re aware of everything involved with your treatment. Download our forms online and what you can expect at our office. We have provided a way for you to complete your new patient forms before arriving at our office. Our forms are fillable, so type your information into the forms, print them, and bring them to our Shawnee dentist’s front desk staff. CareCredit: A third party financing company specializing in financing medical procedures, such as dental work. As a courtesy to our patients, we submit insurance claims on your behalf. In addition to submitting insurance claims, our team is dedicated to making your services as easy and affordable as possible. Start the journey to a beautiful and healthy smile with our Shawnee dentists today.